It's been a busy year and on November 2nd, Shamrock FC closes out its St. Louis MMA calendar for 2018 with Shamrock FC 311 at River City Casino. With a half dozen shows in both the KC and St. Louis markets, SFC continues to grow. Improvements to production, addition of new venues in St. Charles, and a partnership with FloCombat are just a few of the things SFC rolled out in 2018. Headlining SFC 311 will be one of St. Louis' hottest pro fighters, Ty Flores, a winner of three straight, putting on the gloves for his third fight in 2018 when he faces UFC-vet James Bochnovic. With youth and momentum on his side, Flores takes on his toughest opponent to date in a fight where his strengths go head to head with the strengths of his opponent. Flores is incredibly durable and never stops pushing forward, preferring to keep the fight at close distances or on the ground where he has good positioning, often leading to submission. Bochnovic is coming off a first-round submission win September at SFC 309 against Flores' teammate, Adam Cella, that snapped a two-fight skid that saw him bounce in and out of the UFC middleweight division. Previous to signing with the UFC, Bochnovic rattled off 8-straight first round finishes that grabbed the attention of UFC matchmaker Sean Shelby leading to his first run with the promotion. A rematch of one of St. Louis' best fights from last year will take co-main event honors as the reigning Regional Pro Fighter of the Year, Sean Woodson (4-0), takes on Rashard Lovelace (4-1), a previous winner of the award. The two put on an epic back and forth battle in the summer of 2017. Lovelace, one of the area's top strikers, looked early to chop at the legs of Woodson while trying to figure out his range. Woodson's punches started to land in the second and momentum swung in his favor, ultimately earning him a unanimous decision. The two were supposed to rematch in March, but injuries postponed the fight. Lovelace hasn't been back in the cage since the fight, whereas Woodson defeated Seth Bazler in his only fight in over a year. Woodson has tried to stay busy and was one of the last cuts for the recent season of Ultimate Fighter, the season that saw SFC alum "Violent Bob Ross" Luis Pena gain national attention. It's been an up and down year for Eric Ellington. After winning his highest profile fight of his career at Bellator 197 in St. Louis, he dropped his first professional bout on a nationally- televised fight at LFA 40. Ellington (5-1) was submitted late in the second round by Miles Johns. 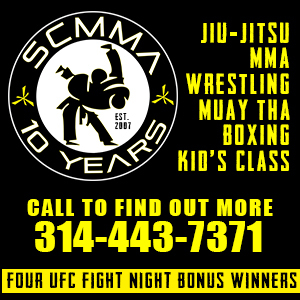 The "Big Dogg" will hope to get back to his winning ways, up a weight class, and now cross-training at St. Charles MMA, against Scott Ettling (5-2). All five of Ettling's pro wins have come by submission, something that should be a concern for Ellington's camp. Ettling, a one-time training partner with Matt Hughes, has a suffocating ground game, and is as about as tough and durable a fighter you will find. Filling out the main card with amateur action, Springfield, MO's Korey Beck will take on Alex Macias. Beck (8-2) was on an incredible amateur run until he ran into Tim Jackson last March. The two competed for the SFC Amateur bantamweight belt, with Jackson getting a first round stoppage. Macaias has been around for quite some time having competed for Rumble Time, NFA, Cage Champs, and just about every amateur promotion in the area. Popular amateur, Shaun Briggs will face a yet to be announced opponent to round out the main card. On the all-amateur prelims, Wendy Jullian will try and stay active when she takes on Davin Boesiger in one of the fight card's three amateur kickboxing matches. Jullian is an incredible talent, and we can only hope this is the start of something big for the hard-hitting attorney from Alton, IL. Two amateur boxers will clash in the MMA cage when Austin Woodcock from Hahn's MMA takes on Jimmy D'Angelo from St. Charles MMA. D'Angelo's teammate Austin Kunz, son of Shamrock FC legend Bo Kunz, will continue his MMA journey taking on Cody Linne. 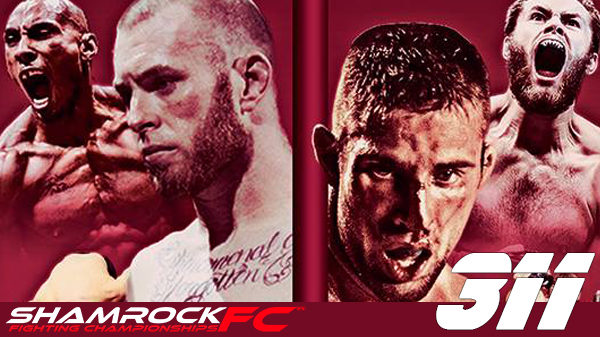 Tickets available from the Shamrock FC Store, and all fights will be streamed on FloCombat.